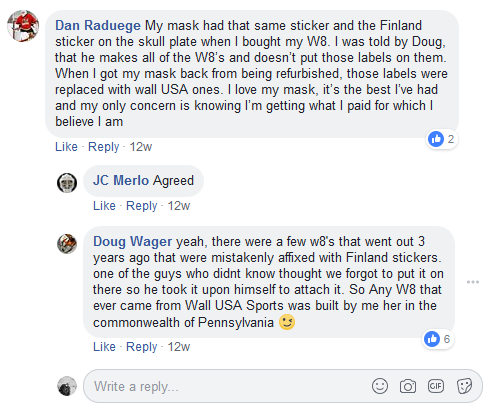 Wall Finland used to sell their masks in North America through David Marlin and Doug Wager ( WZLhead ). There was some sort of rift and they split. Marlin and Wager are selling North American made “Wall masks” that share a shape and that’s it. They are not using any of the newer materials that Wall Finland is. Any Wall fans know more about this? There was some drama on GGSU about this. Wall Finland says all "real" Wall masks are made in Finland. Anyone know who Dave Marlin is? 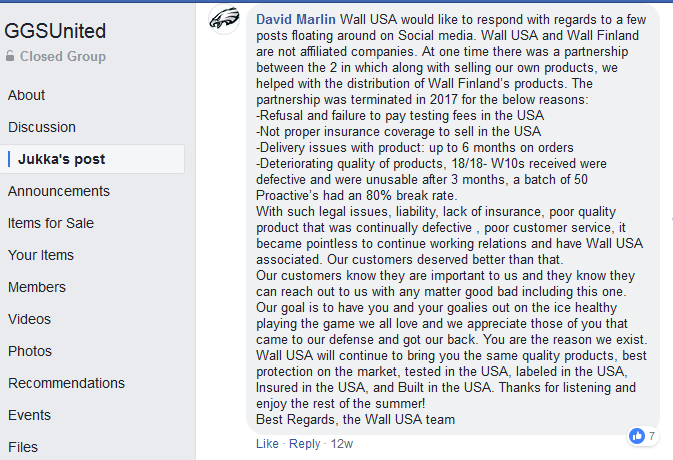 And.... if you go to Pennyslvania's Secretary of State website and search business entities, Wall USA LLC's address is the same as the address shown in the FinlandUSAHockey link. I personally know the founder and CEO of Wall Masks, mr. Petri Karvinen and he definitely is anything but an a-hole. He is a true gentleman and gives first class customer sevice. It is hard to believe that he otherwise would have been making goalie masks over 25 years and earned almost a cult status in Finland. Hopefully my comment earlier were clear. I don’t know Petri and I’m not taking sides. That was my point. It’s a fascinating story though. Yes, it was. No problem with that. ? I have a Wall and ordered it as well as any replacement parts through Finland only. Yes, it's been more expensive for shipping etc... but my trust in buying directly from the original manufacturer would appear to be worth it. A couple guys I skate with have Wall USA masks and while they initially appeared to be of similar in construction there have been durability issues. None of which I experienced after having my mask for much longer. I would just buy directly from Wall (Finland) web-shop. Then you know for sure what you are getting. Wait is that the same Dave Marlin who was Kiprusoff's goalie coach at one point? Would explain the Finnish connection. Just chiming in on replacement parts.